"There was absolutely no pain, and I was amazed at how fast everything healed." "My experience with Dr. Baskin, his staff & operating room personnel was a total pleasure"
"I sincerely appreciate the care you've given me & your ever-patient manner." "A warm note of thanks to say people like you help make the world brighter." "It's a pleasure to be able to see clearly again. Your hands are really blessed." "I truly appreciate your very kind attention and your expertise. You are a great doctor!" "Dr. Baskin readily answered all of my questions and is very easy to get in touch with." "Thank you, Dr. Baskin, for giving me the confidence to look in the mirror again!" "I would highly recommend him to anyone considering his services." Dr. Mark Baskin is a board certified ophthalmologist and ophthalmic plastic surgeon treating patients from throughout Los Angeles from his practice located in Encino, California. His patients benefit from his expertise in blepharitis and dry eye treatment. He performs many ophthalmic surgical procedures that include eyelid lifts, eyelid ptosis repair, chalazion excision and eyelid reconstruction after cancer removal. He is an expert in the administration of Botox, Dysport and Xeomin and the injection of dermal fillers such as Juvederm, Restylane and Radiesse. He and his staff pride themselves on providing individualized, compassionate care in an intimate, warm setting not commonly seen today. Dr. Baskin completed his undergraduate training at Princeton University and received his medical degree from the University Of Illinois College Of Medicine, where he was an Edmund James Scholar. He completed an internal medicine internship at UCLA and a residency in ophthalmology at the Illinois Eye and Ear Infirmary at the University of Illinois in Chicago He served three fellowships: in neurology at the King's College Medical School in London, England; in uveitis at the Illinois Eye and Ear Infirmary in Chicago; and in oculoplastic surgery with Dr. Pierre Guibor in New York City. He is the founding director of the Ophthalmic Plastic Surgery Clinic at Cook County Hospital in Chicago and was an Assistant Clinical Professor of Ophthalmology at the University of California in San Francisco. As an Assistant Clinical Professor of Ophthalmology at the Jules Stein Eye Institute at the David Geffen School of Medicine at the University of California at Los Angeles (UCLA), he teaches physicians in practice, residents, and fellows. He is the ophthalmic consultant to the world famous Grossman Burn Center in Los Angeles. The Center has been featured on Oprah and the Discovery Channel and provides care to individuals from all over the world. Dr. Baskin believes that eyelid surgery can enhance your appearance and reconstruct anatomical defects required for maintenance of ocular health. For example, he performed reconstructive surgeries on a Ugandan woman severely disfigured by battery acid who came to the Grossman Burn Foundation for treatment. Dr. Baskin reconstructed her damaged lower eyelid allowing a prosthetic eye to be made and successfully worn. The surgery was performed at West Hills Hospital and Medical Center in West Hills, California. To learn more about the ocular surgery Dr. Baskin performed on this patient, click here. Known for dedication to perfection in reconstructive and cosmetic surgery, Dr. Baskin is a trusted provider, with area physicians who regularly referring patients. He strives to combine the skill of surgery with an artistic, delicate touch enabling achieving results for his patients which surpass their expectations. In his spare time, he plays trombone in a jazz band that regularly performs throughout Southern California. He has lived with his family in Los Angeles since 1989. If you live in the San Fernando Valley and have scratchy, irritated eyes, it could be the Santa Anas, or it could be chronic dry eye. You may be one of the millions of Americans who don’t produce enough natural tears. But don’t cry — there’s hope. Do you have a growth on your eyelid that started small but is expanding? Is it causing discomfort, tearing, or blurred vision? If so, you may have a chalazion. Read on to learn what it is and how to treat it. Some wonderful notes received from happy patients! Our practice accepts most major insurance plans and most of the smaller insurance plans. If we do not participate with your insurance, and your plan allows out of network benefits, our office staff will assist you with the necessary paperwork so you can receive reimbursement directly from your insurance company. If you do not see your insurance listed below, please call the office to speak with one of our knowledgeable staff members about your individual coverage. "I could not believe my good luck in finding such a caring doctor, both before and after surgery. Thank you." "He has excellent bedside manner and I have recommended him to anyone I know that needs an ophthalmologist. He is a doctor that truly cares about his patients." 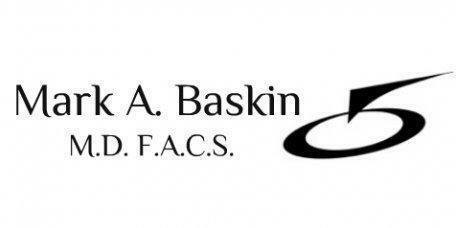 "You'll never find a more knowledgeable doctor than Dr. Baskin, and his knowledge is only matched by his compassion. If you want the best in eye care, call Dr. Baskin!" "I just want to say "thanks..." the surgery on my eyelids was a great success and it is a pleasure to read again without seeing double vision." "There was no pain, and I had a quick recovery. I would do it again in a minute! When you have just celebrated your 53rd birthday, these comments are especially welcome!" "I just wanted you to know how I appreciate the way you applied your skill in doing my eyes. I am extremely pleased with the result and the way you handled everything." "At 53 I feel prettier than I ever did as a young adult. More importantly, the surgery has turned me into an attractive, self-confident woman. You are a creative genius." "I am so glad I found you. I would recommend you and your laser procedure to anyone. My only regret is that I didn't find you sooner!"